I SHOULD have spent the last two days climbing Munros with friends in the west. Unfortunately, the weather wasn’t staying on plan. While we in the east have been waking up every day to sunshine and blue skies, the north-westerlies have been driving in at full force accompanied by bands of rain. In such a small country, it’s easy to forget how dramatically different conditions can be in just a few short miles, so false optimism had been built up for our climbing ambitions. A few showers, yes, but MWIS was predicting 60mph winds, with squally rain, even snow, and a distinctly minus feel on the high tops. Footage from The Ben over the last few days has been more reminiscent of winter. White hell, indeed. We pulled the plug, deciding instead to keep our powder – and ourselves – dry for another day. Gone are the days when I would go out in any conditions just to get a tick. Now I would rather chase the good weather, even when it means a wander to an ‘inferior’ peak. Call me selfish, but I’ve watching the skies over Lochinver with interest, happy to have seen almost constant rain for nearly two weeks. You see, we are heading there in a couple of weeks and I’m hoping this is all the water being blown out of the system and that we will be greeted with Med-style conditions. 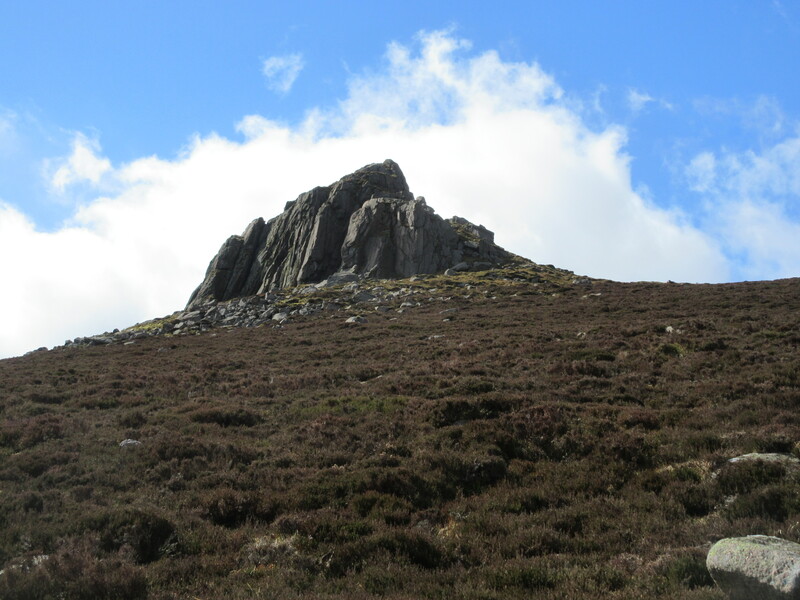 So while my walking companions sat it out in the wild west with the rain battering on the windows, I followed the blue skies over the Cairn o’ Mount to the miniature gem that is Clachnaben. There was still the wind to contend with, but I stayed low for the early part of the walk, heading west on a track, then north and finally east along the broad ridge with the worst of the blasts at my back. Occasionally I would catch a spot of moisture but with hardly a cloud in the sky and the sun beating down, it appeared they were being blown in from a long, long way off. It appeared the bird life was heavily into the spring frame of mind: pheasants crashing out of the trees, gargling grouse invisible but noisily close by, and wagtails and siskins in constant aerial combat with rivals, oblivious to my presence. Once the early woodland had been left behind, the terrain became bleaker. One sad stand of ancient Scots pines looked to be clinging on to the final stages of life on a crumbling slope, their exposed, twisted, grey roots seemingly reaching out for help. The depressing aspects of the grouse moor took over, stretching for miles across the skyline towards the Corbett, Mount Battock. Higher up, above the bulldozed tracks and lines of shooting butts, were swathes of scorched earth, black, bleak patches of desert. 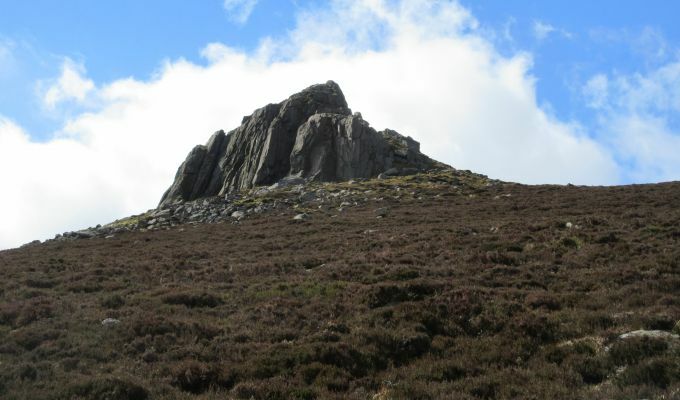 The summit rocks of Clachnaben provided some respite from the wind, but standing at the highest point was a little precarious. One good shove from the wind could have led to a serious tumble. 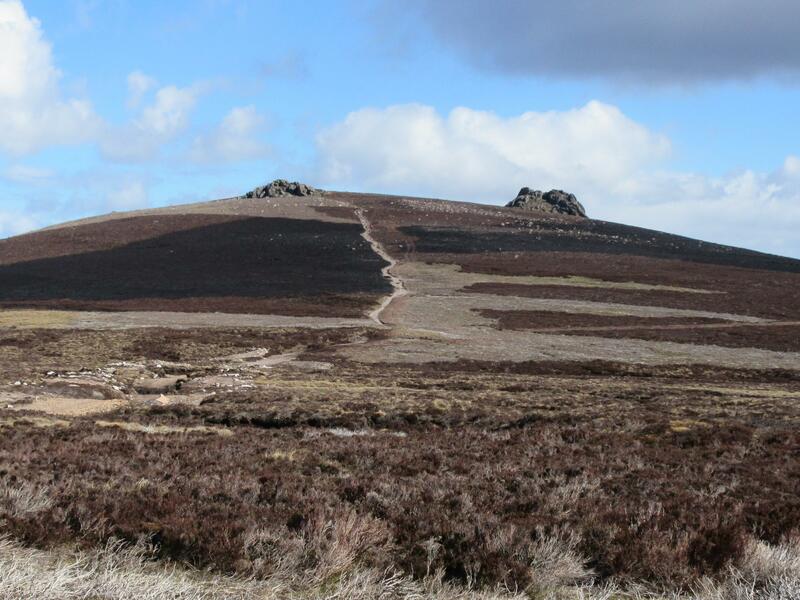 Clachnaben is very much a local favourite and the paths were busy with a more diverse clientele from that of most Scottish hills; dog walkers, casual strollers and families enjoying the Easter sunshine. The next day I was in Glen Doll on a wildlife expedition with the grandkids. The hoped-for frogs, toads and snakes proved elusive but a close inspection of the insect world kept everyone happy. Sometimes, there’s nothing wrong with settling for second best.